I have 20 years B2B telemarketing, telesales and lead generation experience, with more than 155 five star reviews within PPH. 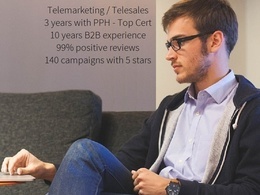 I can deliver sales, appointments, web demos, web...Read moreI have 20 years B2B telemarketing, telesales and lead generation experience, with more than 155 five star reviews within PPH. 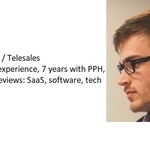 I can deliver sales, appointments, web demos, web subscriptions or data capture. I can help you make the most of telemarketing, telesales and lead generation campaigns. Throughout our campaign Rob has displayed a very professional, knowledgeable and consistent approach to the work at hand. The feedback in particular has enabled us to view our products and services in a new light and given us valuable insights for future progress. Rob has been a pleasure to work with. He acts with integrity and honesty which for me are vital for a productive partnership. He was able to advise and shape our campaign to maximise time and resource to get us the results we wanted. I'm looking forward to picking things up again when appropriate. I've worked with many telemarketers in the past, and Rob stands out as one of the best. He really makes sure he understands the product, demonstrates an exceptional knowledge of the craft of cold calling, and is laser focused on achieving your business goals; not just working the time paid. Highly recommended and will use again. Rob did a great job on our telesales campaign. He kept us up to date throughout and helped us achieve appointments within a challenging software sector. A truly focused professional. Rob achieved an appointment for us on the first day and kept us well informed of progress throughout the campaign. It's been a challenging campaign but Rob has gone above the call of duty with his efforts to make the campaign a success for us. I hope to use him again in the new year when I'm sure the conversions will improve as the customers will be easier to get hold of (this is notoriously a very busy period for our prospects), and because of the effort Rob has gone to to build up the list and qualify the leads in preparation for the new year. Rob has done a great job for us. I'm very happy with the quality of the leads he has generated in a short time. Definitely looking forward to a long term engagement. Rob is an extremely professional resource to work with. Well experienced and a pro at developing business relations. He has not only provided us guidance in cracking into a large market, but has also managed to achieve great results in lead generation. He has definitely lived up to our expectations and we look forward to working with him again. Great service, very reliable with great attention to detail. Will be using again in the New Year! Rob has been fantastic to work with. Very professional, organized and efficient. He has done a great job for us and we aim to continue working with Rob over the coming months. Highly recommend! Collaborative, enthusiastic and effective – he got the results we needed. Rob made an effort to add value to every aspect of the campaign, his consultative approach, broad experience and initiative proved very valuable. He’s pleasant to work with and his communication was excellent.